Retha Booysen will carry on with the breeding of my boerboels. She is absolutely devoted to the Boerboel dog and a caring breeder. She is the most suited person to take over from me - I will still be available for chats and advice. It has been a long and happy journey for me with the Boerboel and meeting so many friends all over the world. Hello and welcome to the Baden Boerboel website. My name is Attie Badenhorst and I breed and take great care of these magnificent animals. 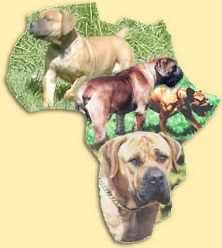 My Boerboel site is aimed at providing you with all the information you require to buy and take care of your boerboel. If you are considering purchasing your own boerboel, I would like to present you with as much information on the boerboel breed as you will need, to make an informed decision as to whether the boerboel is the right breed for you. We take great pride in the breeding and care of our champion boerboels, and we trust that this will become evident as you peruse our site. All the necessary registration and health information on each of our Boerboel breeding animals is available on our Boerboel Breeding stock page. You will notice that all our Boerboels are hip dysplasia free and their health certificates are available for your perusal. Our Boerboels are all treated as family pets, and all our puppies are ready to become your family pet and protector. Boerboels make fantastic family pets and efficient watchdogs. 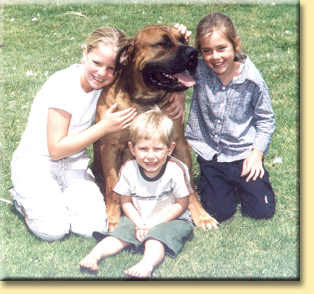 For more information on boerboels and children view our Boerboels and children page. Boerboels also respond very well to training. View our page on leading your Boerboel to see how best to train your boerboel. Our Boerboel gallery is full of wonderful photos of many of our boerboel breeding animals as well as our boerboel puppies. To truly understand the boerboel, you really need to have a look at the Boerboel gallery. You will love the puppies! We have also covered topics such as boerboel nutrition, choosing your boerboel, accidental boerboel training and many other topics relevant to the boerboel enthusiast. Please use the navigation bar at the top of each page to navigate through our site. We appreciate feedback from our visitors as it helps us to keep our website relevant to their needs. I have Veterinarian Certificates on the temperament and mental stability of each of my boerboels.